"Keep Calm and Carry On" was a motivational poster produced by the British government in 1939, several months before the beginning of the Second World War, intended to raise the morale of the British public in the aftermath of widely predicted mass air attacks on major cities. 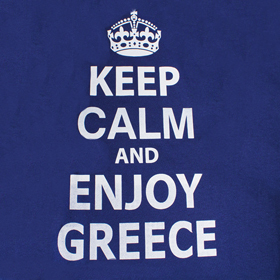 This is a humorous version intended for visitors in Greece! 100% Cotton Tshirt made by Haynes. Men sizes - Unisex style.